If you are reading these words you must be acutely aware that there has been a massive decline in basic manners and civility in our country. Many of the basic rules of manners and etiquette used to be passed down from parents to their children through the generations. But it seems that this practice has skipped the past few decades. These days, if a man holds open a door for a woman he may be called a misogynist. Nevertheless, if our nation is ever to become good again I believe it must start with us as parents in our own homes. I believe that we as parents have a duty to pass on to our progeny the basic manners and rules of etiquette that Scottish writer Alexander McCall Smith referred to as “the basic building blocks of civil society.” That is exactly what I have endeavored to do with this little book. 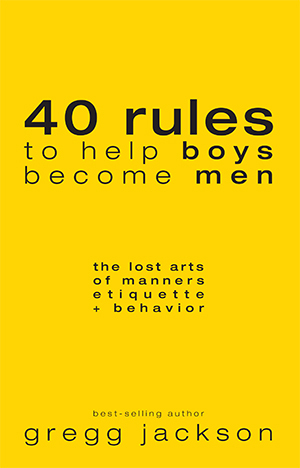 My hope and prayer is that a significant segment of this current generation of young boys, young adults, and subsequent generations will adopt these basic manners and rules of etiquette to help restore the civility, morality, decency and courtesy in America that was once commonplace.